Hey guys! I get sooooo excited to talk about skincare with you guys!! A couple weeks ago I shared my full routine on stories from start to finish. One of the things I do EVERY SINGLE morning is put on a Vitamin C serum. 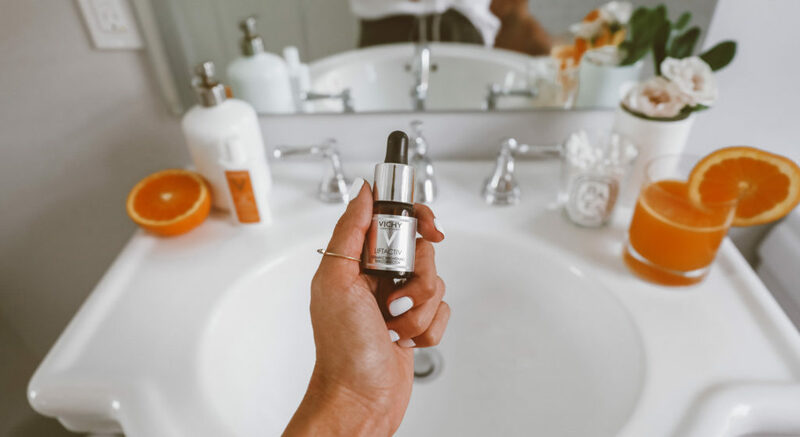 When life gets crazy with work and the kiddos, and I have 2 minutes to get ready, there’s always something that’s gotta give (and most of the time it’s dishes or cleaning the house ), but there are a few things that I’ll never skip – SPF, a Vitamin C serum, and moisturizer. 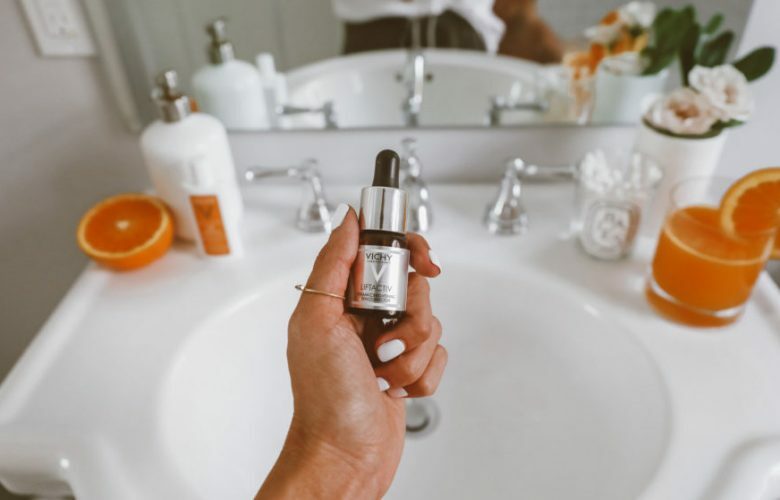 Within weeks of using a Vitamin C serum, not only will you notice a difference when you look in the mirror, but you’ll feel a difference too! Here are 5 reasons everyone should be using it and why I won’t go a day without it. Improves skin texture and quality: Our skin goes through a lot over the years, and I think most of us can agree that at some point or another we’ve dealt with texture problems, uneven complexions, or even pigmentation issues from acne scars or sun damage. Vitamin C can actually reverse a lot of those issues. It penetrates the skin and helps to fade pigmentation and stops inflammation, which will even out your complexion. Minimizes fine lines and wrinkles: Vitamin C works wonders for anti-aging purposes! It stimulates collagen production, so your skin will look firmer and more luminous over time. It also brightens skin so it’s a great morning pick-me-up. I’ve shared a few different brands I’ve used before. Vichy just launched this Vitamin C Serum and I’m an avid believer in their whole line and I was excited to start using theirs because it has their Mineralizing Thermal Water which my other ones lack. Their Mineralizing Thermal Water has 15 different minerals to protect your skin from pollution, stress, and fatigue. Vichy’s Vitamin C Serum also has 15% Pure Vitamin C and helps brighten, strengthen, and firm your skin. Protects against future damage: Not only does Vitamin C slow down signs of aging and reverse current skincare damage, it also protects against future damage as well. You are much less likely to develop further skincare issues like acne, brown spots, and even stretch marks by simply adding this step into your skincare routine, hence why I will never live without it! Are you guys already using a Vitamin C serum? Are you as addicted to it as I am? If not, head to vichyusa.com to try their LiftActiv Vitamin C Serum! You can also use code: CHRISTINE18 for 20% off and free shipping!